The Farragut Houses near DUMBO have 4043 outstanding repair requests, according to data by NYCHA Watchlist. DUMBO — Farragut Houses resident Mary Orane, 79, feels unsafe in her home. There is a large crack in her front door making it impossible for her to close it properly. Four months ago her son Anthony, 54, filed a work order request with New York City Housing Authority on behalf of his elderly mother. No one has come to fix it. Victoria C., who declined to give her full last name, has mold growing in her bathroom. Over the last year the mold has been aggravating her asthma. She filed a work order request two months ago and last week a NYCHA representative came with a bucket, soapy water and a mop. He was unable to clean the mold and has not returned to finish the job. "I stopped using my bathroom," she said. "I'm constantly coughing because of that smell and it's dripping down the side. You can't imagine the smell, it's horrendous." Orane and Victoria's official repair requests are just two of 4,034 unanswered complaints filed by Farragut House residents as of February 15, 2013, according to data released by Public Advocate and mayoral candidate Bill de Blasio. His new website, NYCHA Watchlist, documents the repair backlog in New York City’s public housing. There are 369,090 outstanding work orders in public houses throughout New York City, according to the site. 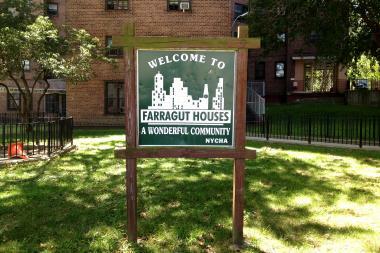 Farragut Houses residents have the third highest number of outstanding requests in the borough. The average number of days that public housing residents in Brooklyn have to wait for needed repairs is 276 days. Victoria, who has lived in Farragut for 27 years, says that most of her neighbors also have complaints about their apartments and the buildings themselves. "The elevators smell like pee, windows are broken, there's mold, the bathtub gets stopped up or it floods," she said. "We got some real things that need fixing." Earlier this year Mayor Michael Bloomberg announced NYCHA's intention to eliminate its backlog of open repair requests by the end of 2013. But some Farragut Houses residents are skeptical. "I haven't seen any changes since the start of the year," Orane said. "But it would be nice to get my mother's door fixed."